When working with PTC Creo 2.0 or PTC Windchill Workgroup Manager 10.2, the PTC Windchill 10.2 Upload action in the workspace has been expanded. This expansion increases the number of states for which CAD content can be uploaded from the client-side workspace to the server-side workspace. These states include local modifications that are not checked out and CAD documents that have duplicate filenames. 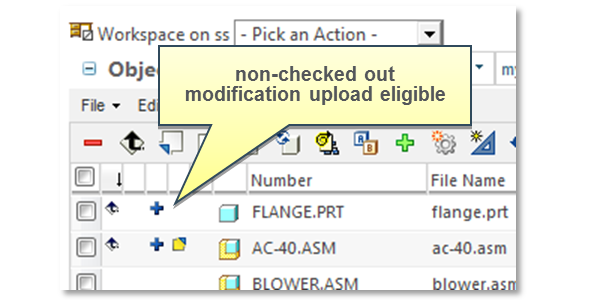 Upload of local modifications that are not checked out from the client-side to the server-side workspace. Workspace Save As support for locally modified content, allowing users to explore "what-if" design scenarios. Consistent workspace views, whether a user is viewing the workspace from the embedded browser in PTC Creo or the PTC Windchill Workgroup Manager. Having all content eligible for upload. This provides a way to use the server-side workspace to periodically back up the work in progress in a user’s workspace, preventing client-side data loss. Allowing users to move from one machine to another without leaving any of their changes behind. This is helpful for users who periodically move from one workstation to another. Duplicate filename support to upload a CAD model with the same filename as another CAD document that might already exist elsewhere in the PDM system. A CAD document already exists in the commonspace (previously checked in) having the same filename. Another CAD document with the same filename already exists in another workspace. Note: Duplicate filename conflicts must be resolved before checkin to the commonspace. To support the duplicate filename, a new Conflict Information status has been added. 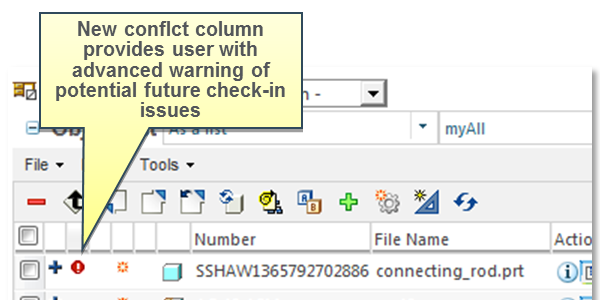 This status can be added to workspace table views, providing advanced warning of these duplicate conflicts before checkin.